Manny's '63 Is A Rolling Example Of What's Possible With Patience And Hard Work. Emmanuel “Manny” Farol’s story started with a car that was thought of by many as a piece of junk. With the ’63 Chevy Impala costing a mere $1,000, you know that it was in need of some serious work. With a little TLC and careful planning, the car became a rolling example of what’s possible with patience and hard work. This ’63 means a lot to Manny, who dedicated the car to the memory of his father. Even though the Impala has already been through two incarnations, and has been featured in music videos like Mike Jones and Snoop Dogg’s “My ’64” as well as the forthcoming movie Walk Hard, you can believe that its current state will soon change again. 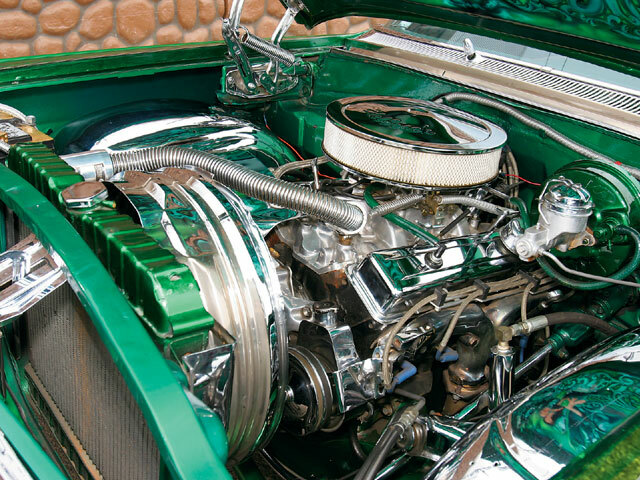 Engine/Drivetrain: A ’72 Chevy 350-c.i.d. 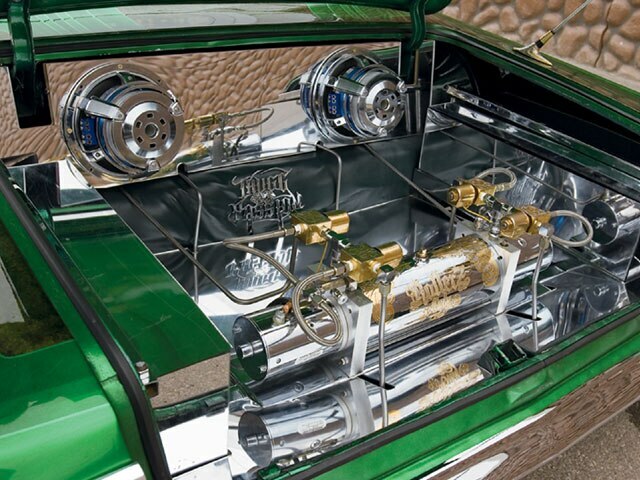 engine with chrome valve covers, fan, air filter and exhaust was built by owner and mated to a 350 Turbo transmission. 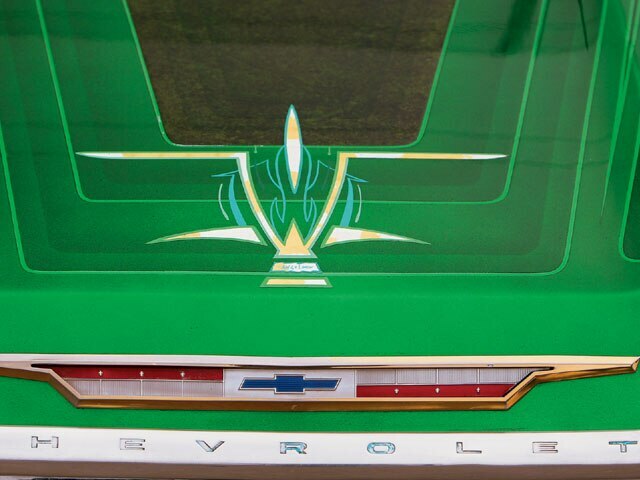 Body/Paint: Body mods include shaved door handles and emblems, and a molded hood and trunk. The paint features 10 shades of green with flakes, fade-aways and marble patterns. 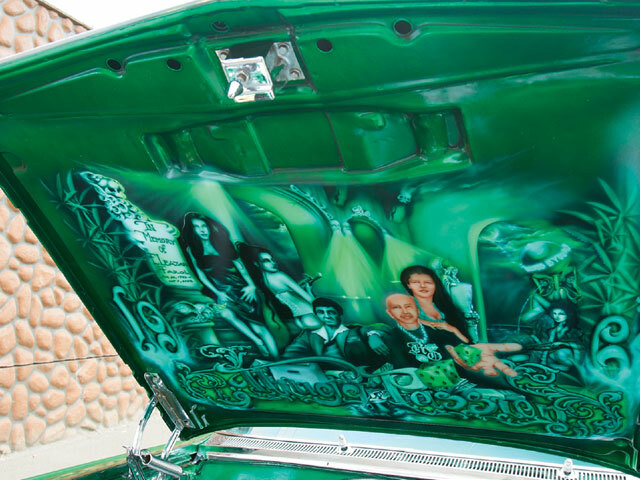 All paint and bodywork was performed by Sal Manzano at Sal’s Customs in Spring Valley, California, with gangster-style murals (including the owner sitting next to “Scarface”) by Mike Johnson of MRJ Air in San Diego, California, and pinstriping by Angelo Maisano. Interior: Green vinyl with tweed inserts in the original pattern performed by “Big Randy” of Rollerz Only-L.A.
Sound System: The head unit controls a CD changer and 500-watt amp, which in turn powers a set of Kenwood 6x9s and Rockford Fosgate tweeters. A 3,000-watt amp powers two 10-inch Audiobahn subs. The installation was performed by the owner. Setup: A fully engraved ShowTime Hydraulics/Homies Hydraulics whammy pump setup, with engraved gold square dumps, 8-inch (front) and 14-inch (rear) cylinders, six switches and eight batteries, was installed by Big Randy. Additional chassis work including a fully wrapped frame was handled by Eddie at Ghetto Fab in San Diego. The engraving on most of the car was handled by Hernan’s Custom Engraving.